Welcome to the Mid-Week Blues-Buster Flash Fiction Challenge, Year 2, Week 35. This week’s song prompt continues the darker theme established by Emiliana Torrini last week. The tune is, “Not of This World”, by Danzig. This week’s Judge is acclaimed author of all things horror… Lisa McCourt Hollar. The challenge opens the moment you read this post and runs through MIDNIGHT PACIFIC TIME on Friday January 30th. This week we had 6 entries, along with a great song. I did want to write for it – and actually have, but will be posting it to my blog as it was inadmissible. As always you guys don’t make it easy to pick. This tale allowed the reader to feel every single second and moment of emotion and tension. And we are pulled through the story not quite sure what the situation is, what the main character has done and is going to do, until the end, completed the full arc of the story. It was powerful and succinct, using all the senses. Loved it. I was totally taken with the rhyme in this one, I love the rhythm it strikes up. It aided to the flow and the story and I am impressed at how it can be achieved. And being written in first person it also brought me closer to the story and the MC. I liked the moral high ground the killer walks on, and also the outcome. Good piece. Ah, the voices that haunt us in life, and control us, however much we want to fight against them. The repetition in this really worked for me, and the tension came across well as the story unfolded, watching someone try and hold onto their sanity. Good stuff. Thanks to all of our writers & readers and thanks to Judge Miranda Kate. Inside, Beau’s décor echoed the no-frills simplicity of the building’s exterior. A polished maplewood bar and a collection of barstools took up the right side of the room. A row of booths filled the opposite wall. Two pool tables were set up in the dark back corner, behind the booths. A brand new dartboard, glorious in red and black and set high in the middle of the back wall, pulled the whole room together. The man himself stood behind the bar, holding court with a couple of guys in matching white t-shirts and blue denim coveralls. Beau was a tall man who filled out the Redskins jersey he wore under his apron. He had a lot of forehead and a wide, flat nose. A shock of dark hair crowned the very top of his head. An unfortunate clump of brown weeds on the point of his chin ruined an otherwise good jaw. Welcome to the Mid-Week Blues-Buster Flash Fiction Challenge, Year 2, Week 34. This week’s song prompt is a dark one (shocker, I know). It’s a great tune by Emiliana Torrini called, “Gun”. The challenge opens the moment you read this post and runs through MIDNIGHT PACIFIC TIME on Friday January 23rd. Four days, five entries. Not too shabby. I’d like to welcome several first-timers to the MWBB family. We managed five entries with nary a peep from any of our usual suspects. Judge Mark Ethridge had good stuff to read. And, here’s the results, as I felt them. And, here I go, reading the five stories this week. @susanORielly3 – Ah. Women. More dangerous than men any day. @StacyFileccia – The short memories of children are a wonderful thing, aren’t they? @RL_Ames – One unpleasant male with a shovel, a car, and a now ex-girlfriend. And no guilt at all. @beckyfyfe – One mother outsmarts her two daughters. Once more. Women. More dangerous than men any day. @alexbrightsmith – Sometimes, a guy has to learn things the hard way, doesn’t he? Five well done stories, all of them winning. So, we’re changing the rules this week, so everyones stories get the recognition they deserve. Honorable Mentions – These go to @StacyFileccia (I wanted more of the children, more of the misery, more of the bleak summer, and more of the dancing in the rain.) and @RL_Ames (724 words, oops. Otherwise, one rather nasty dude in this story.). 3rd Place – @alexbrightsmith (Love the story. Just felt like I was missing some detail somewhere). And 1st Place – @beckyfyfe (The wisdom of motherhood, and the magic ability mothers have to change everything). There you have it guys. No one lost this week. Thank you all for writing stories I had such fun reading. Becky– here’s a Winner’s Badge for your collection. Thanks to all of our writers and readers, and thanks to Judge Mark Ethridge. She laughed while I scribbled my name and license plate number down. She had a nice laugh, throaty and well-used. “What brings you all the way out here, Mr. Tunner?” she asked, glancing at the register. I spun the register book around and slid it her way. She did not offer to shake hands. She leaned forward, resting her arms on her side of the desk. She dropped a conspiratorial smile on me. I couldn’t help but smile back. “Mind if I steal that line from you?” I asked her. I paid her for a week’s stay. She handed over the key to room fourteen. 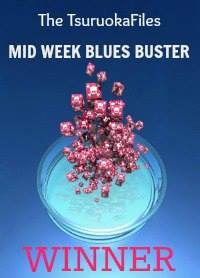 Welcome to the Mid-Week Blues-Buster Flash Fiction Challenge, Year 2, Week 33. This week’s song prompt comes from Scottish post-punk heroes The Jesus and Mary Chain. This week’s Judge is flash fictioneer extraordinaire… Mark Ethridge! The challenge opens the moment you read this post and runs through MIDNIGHT PACIFIC TIME on Friday January 16th. Another edition of the Mid-Week Blues-Buster is in the books. Judge Laura James had six great entries to review. In First place goes to Drmagoo. I just loved this, the journey, the awkwardness of fellow passengers (so been there lol) and then that ending. Wow, total punch in the guts, great stuff. My Second place goes to Lisa Shambrook. As always Lisa’s way with words helps me get her characters and then when we find out the hidden person is actually not a person at all, brilliant. Finally Third to Ruth Long. What I thought was a simple tale of moving on turned out to be much darker. The interactions between the women are perfect, so well written. I’m also giving a wee Honourable Mention to Nick Johns, very clever writing – I didn’t truly get it till the last line. As I never seem able to write for the Blues Buster I’m in awe of all who attempt this, congratulations to everyone. Note- I’m pretty sure I busted the 10-12 sentence limit. Sorry. Didn’t make sense to chop this bit in two. A cloud of warm, humid air from within hit me full in the face even before I had the screen door all the way open. The room smelled of mulch, sweetened by incense and decades of accumulated sea spray. The ceiling was white– sort of. The carpet was orange. The walls, hidden behind two rows of potted palms and other forms of tropical plant life, could have been painted any color. Battered wicker and rattan chairs filled every space where the walls dared to peek through the greenery. The mulch and the humidity had done wonders for the foliage. I had to hack my way down the middle of the room to reach the desk. A tall woman with steel-gray dreadlocks and fantastic shoulders awaited my arrival. Her orange tank top fell nicely over her curves. A pair of faded blue jeans picked up where the shirt left off. A thick green candle sat on the desk, in front of a rusted rack of picture postcards. The flickering light cast a glow on the woman’s warm brown skin. She eyeballed me from top to bottom. “You sure you’re in the right place, mister?” she asked. “You got a fridge in the room?” I countered. That question earned me a slow nod. I noticed she had a bit of a cauliflower ear thing going on on the right side. “I’m gonna pretend I didn’t hear that,” she growled. I stepped up to the desk and picked up the pen that lived next to the open register. Welcome to the Mid-Week Blues-Buster Flash Fiction Challenge, Year 2, Week 32. This week’s song prompt comes courtesy of singer-songwriter Sarah Jarosz. This week’s Judge is the proprietor of the Office Mango blog, flash fictioneer pro… Laura James.The challenge opens the moment you read this post and runs through MIDNIGHT PACIFIC TIME on Friday January 9th.Now… Go write!! !